Aside from the Computex and D9 conferences, it has been pretty quiet in the Windows 8 scene. But new information was revealed today indicating that Windows 8 will get better crash-detection features, a 3G/Wi-Fi/WWAN Cost Limiter and a taskbar with multi-monitor support. As ITWorld reports, three new hidden features were discovered in Windows 8 that showcase a 3G/Wi-Fi/WWAN Cost Limiter, better crash-detection features, and a taskbar with multi-monitor support. This new feature will help users cap data transfers on 3G, 4G, WiFi, and WWAN connections. From the information discovered within the group policies, administrators can set the connection to Unrestricted, Fixed, or Variable. 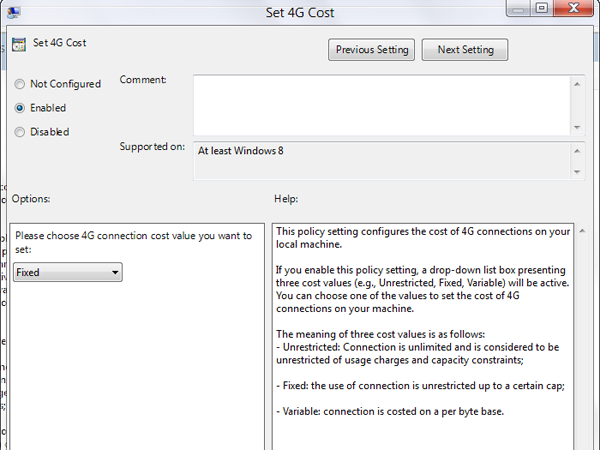 The Variable setting allows for a “cost per byte” basis to help the user keep his mobile costs down. Administrators can also disable mobile roaming connections for their users too. All these nee tidbits make sense as Microsoft is planning on pushing Windows 8 to the mobile market.